LAS VEGAS – Guinness fans from around the world have the opportunity to learn the six steps to pour the perfect pint of Guinness with the Perfect Pint Experience at the newly redesigned GUINNESS Store, located next to Rí Rá Las Vegas inside The Shoppes at Mandalay Bay. Following the unique one-on-one experience, guests will drink their pints and take home mementos from the experience. Welcomed inside by the grand Gilroy ‘Zookeeper’, a famed Guinness icon from Guinness history imported straight from Ireland, beer enthusiasts will be drawn to the beautiful bar top framed by a wall of Guinness branded pint glasses and a high polished copper ceiling. The bar, fully equipped with three Guinness bar taps, is where guests can take part in the only ‘Official’ Perfect Pint Experience in the world outside of the GUINNESS Storehouse in Dublin, Ireland. The exclusive experience is designed to teach beer lovers the essential six steps to pouring the perfect pint while also learning the history behind the iconic brand. Guinness lovers can join in the craic – or Irish-style fun – after learning each step and pouring a pint into their own 20-ounce official Guinness glass. At the end of the experience, guests will take home a personalized certificate to celebrate their completion of the perfect pour, a framed commemorative photograph and the 20-ounce glass they filled with Guinness. The GUINNESS Store offers packages for both individuals and groups of 20 people or more. For a group of 20 or more, it offers everything included in the individual package plus a 10 percent discount on all Guinness merchandise. The GUINNESS Store has various packages including the “GUINNESS Store Exclusive”, offering guests the option to rent out the entire store which is perfect for private events that offer its guests individual benefits. For two hours, guests can take part in the Perfect Pint Experience, enjoy delicious appetizers with pints of Guinness, and receive a 10 percent discount on all Guinness merchandise within the store. The Perfect Pint Experience is only for guests 21 years and older. Includes a 20-ounce official acrylic Guinness glass filled with a pint of Guinness, personalized certificate and framed photograph. Includes a 20-ounce official acrylic Guinness glass filled with a pint of Guinness, personalized certificate, framed photograph and a 10 percent discount on all Guinness merchandise. Includes private use of the store for a two hour time frame, passed appetizers, 20-ounce pints of Guinness, personalized certificates, 20-ounce official acrylic Guinness glasses, framed photographs and a 10 percent discount on all Guinness merchandise. Please note, passed appetizers are not unlimited. Price information for the GUINNESS Store Exclusive Package are available upon request by contacting a Guinness Store representative. For additional information or to reserve your experience today, please contact a GUINNESS® Store representative by calling the store directly at (702) 632-7773. 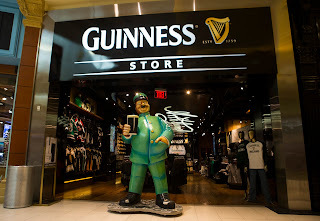 With the largest selection of Guinness merchandise located in one venue outside of Ireland, the GUINNESS Store Las Vegas is a “must see” destination filled with true Irish hospitality. Visitors to the store not only have the opportunity to purchase quality Guinness products, they can learn about the brewing process and the depth of richness of the Guinness brand through visual exhibitions showcasing its legacy and the strength of its advertising. 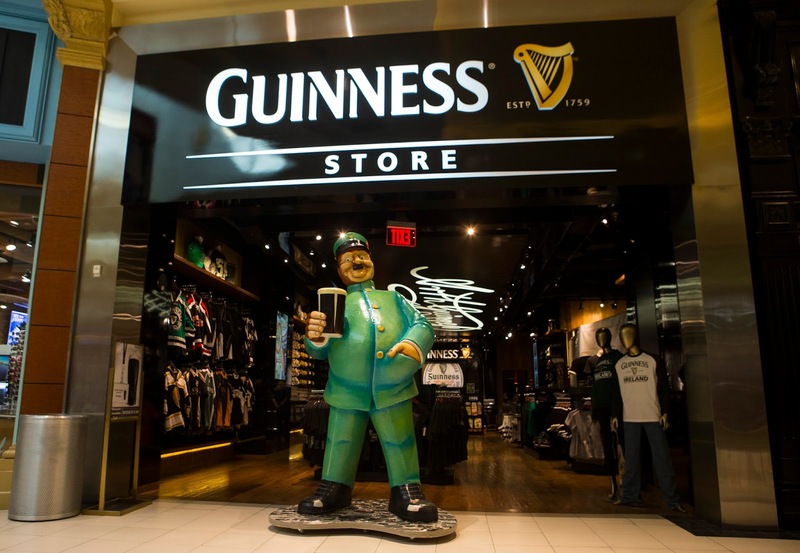 The GUINNESS Store is open from 10 a.m. to 11 p.m. daily inside the Shoppes at Mandalay Place. Follow The GUINNESS Store Las Vegas on Facebook, Twitter and Instagram for the latest news and updates.